A scene from the acclaimed Finnish film, Unknown Soldier, which is screening at the Subtitle film festival in the Town Hall Theatre. A POSSESSIVE woman, a screwball crime comedy, French workers versus capitalism, Finnish soldiers in WWII, corrupt politicians, and the bad tempered boss of a catering company - the Subtitle - European Film Festival is coming to town. Subtitle returns to the Town Hall Theatre on Friday January 25, Saturday 26, and Sunday 27, with eight films, including four from France, that have been box office smashes and/or won awards on the European continent. At a time when foreign language films and programmes are more popular than ever, with the public now recognising, seeking out, and hungry for quality viewing from the Continent, this is a great chance to see these acclaimed films on the big screen. Subtitle opens with A Horrible Woman (Denmark, 2017 ) on Friday 25 at 6.30pm. When Rasmus meets Marie, he is certain she is the love of his life. However, she is actually possessive and manipulative, and her insistence on dominance in their relationship proves corrosive. A film full of insight and wit on modern relationships it is held together by a winning, charismatic, performance from Amanda Collin (Department Q ). Starring Adèle Haenel (Love At First Fight ), The Trouble With You (France, 2017 ) is screwball crime comedy, about a detective who discovers her late husband was a crooked cop. Shocked by her discovery, she is determined to right the wrongs he committed, which eventually leads her to Antoine, who was unjustly imprisoned for eight years. Cue a series of misadventures, wild mishaps, and bizarre accidents. See it on Friday 25 at 8.30pm - and watch for a cameo from Audrey Tautou. David (Fabrizioi Rongione, Two Days, One Night ) is a happy husband and father of two. He is a popular man and his family enjoys regular holidays. Coming back from his latest trip, he is arrested by the police. Doubt and suspicion grow and family and friends take sides. This is The Benefit Of The Doubt (Belgium, 2017 ), a gripping exploration of the effect of judgment by intuition and the nature of doubt itself, see it on Saturday 26 at 1pm. Workers rights in the face of free market capitalism will be explored in At War (France, 2018 ), which was a hit at this year's Cannes Film Festival. Perrin Industries decides to shut down a factory. The 1,100 employees, led by their spokesman Laurent [played by Vincent Lindon, pictured above], decide to fight this brutal decision, ready to do everything to save their employment. As the stakes rise, so do the problems and the harsh realities of working in the manufacturing industry in today’s free-market world. See it on Saturday 26 at 3pm. In Styx (Germany, 2017 ), Rike decides to leave behind her job as an emergency doctor, and fulfil a long-held dream of sailing single handedly to Ascension Island in the Atlantic. However, after a storm, she finds herself near a stricken fishing boat. She radios for help, but what on earth can she do until help arrives? There are close to 100 people in danger of drowning. Find out what happens on Saturday 26 at 5.15pm. A Subtitle Irish premiere, Unknown Soldier (2017 ) is the biggest ever-grossing picture in Finland ($17 million ) and is nothing short of a triumph from director Aku Louhimies. 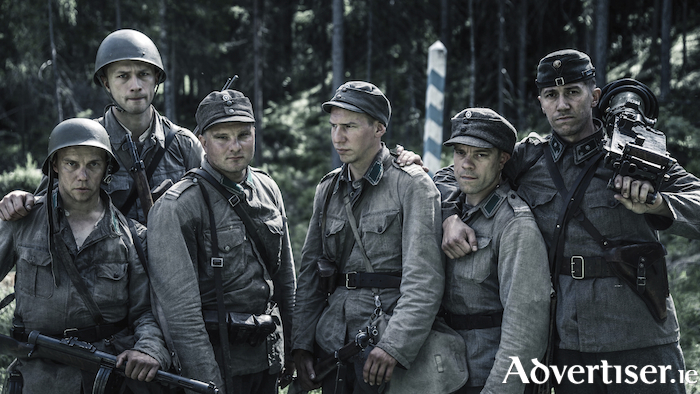 Based on a best-selling book by Väinö Linna, about his experiences in the war, it follows a platoon of ordinary Finnish soldiers in the battlefield between Finland and the Soviet Union. Louhimies has based his picture on the uncensored version of Linna's book, which anchors the film with an unflinching realism. It will be screened on Saturday 26 at 7.15pm. Manuel Gómez Vidal (Antonio de la Torré, I'm so Excited, Volver ) is a charismatic and hugely popular politician. He has also been enriching himself with public funds for years. After his corrupt activity is exposed, and his party move against him, Vidal digs in his heels. He has no plans to give up power and position. This is the political thriller The Realm (Spain, 2017 ), which will be screened on Sunday 27 at 12.45pm. It also features a terrific soundtrack by Olivier Arson. The hit comedy, C’est La Vie! (France, 2017 ), directed by Éric Toledano and Olivier Nakache (The Intouchables ) closes the festival on Sunday 27 at 9pm. Max is a veteran wedding planner who is thinking about selling his business. Ahead of that he must organise a lavish wedding in a 17th century chateau. No small task: there are dozens of people to manage, unreliable electricity, a last-minute musician change, and a groomzilla to deal with! Everything that can go wrong, does go wrong, with laugh-out-loud results. "This is our strongest line up of films," said Subtitle founder and director Richard Cook. "Don't miss the outstanding A Horrible Woman. Ridley Scott saw Amanda Collin's performance in this film last month and just put her in the lead of his new series shooting in Cape Town. The great thing about working with the Town Hall for this festival is that this is the only time that audiences will get to see these pictures on the big screen and in truth, that's where they should be seen." Tickets for individual films, and a ticket to see all eight are available from the Town Hall Theatre (091 - 569777, www.tht.ie ).